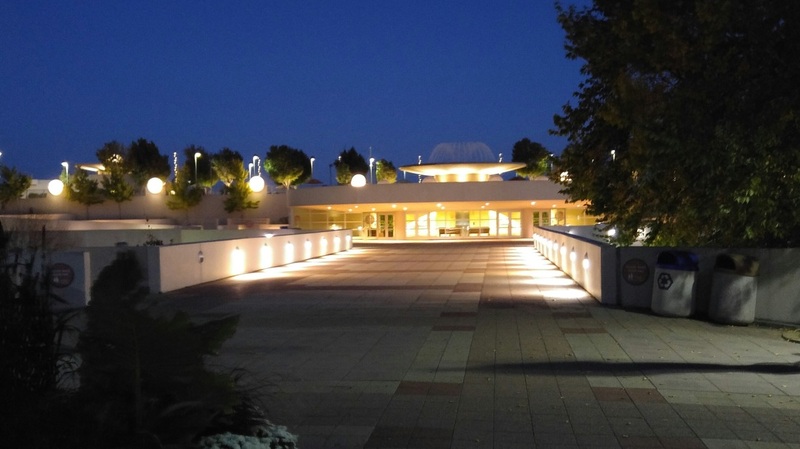 Learn how you can actively petition the Madison Common Council to join over 40 cities in support of the United Nations Convention on the Elimination of all Forms of Discrimination against Women (CEDAW). This is the UN treaty known as the ”international bill of rights” for women. CEDAW affirms the fundamental rights of women and girls and sets out a comprehensive framework to combat gender inequality and eliminate gender discrimination. "A Girl in the River The Price of Forgiveness"
Ahmed Abu Artema is a 34-year-old Palestinian journalist, poet and peace activist. He is the author of the book "Organized Chaos" and his writings have been published in the New York Times, 972 Magazine, The Nation, Common Dreams and Mondoweiss. One of the founders of the Great March of Return, he has been interviewed by NPR, Middle East Eye, Al Jazeera, and CNN. 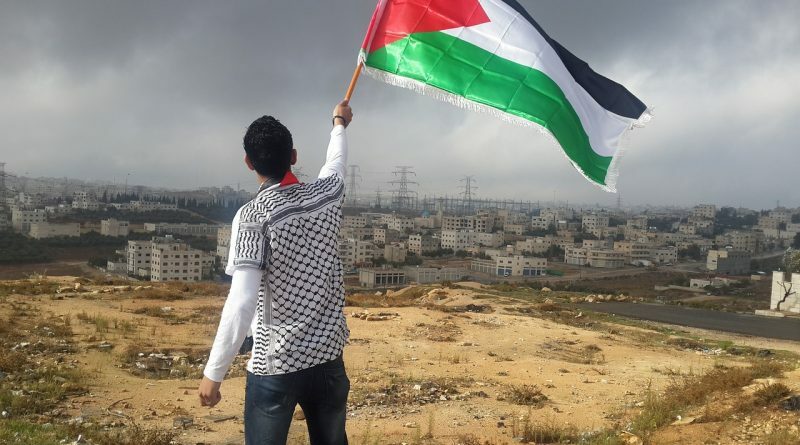 His family was forced from Al Ramla village in Palestine in 1948 and he was born and grew up as a refugee in Rafah Camp in the Gaza strip, unable to even visit his ancestral home in what is now Israel. 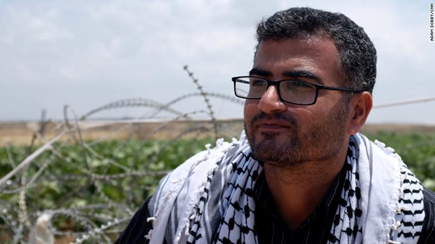 He lives in Gaza with his wife and four children. 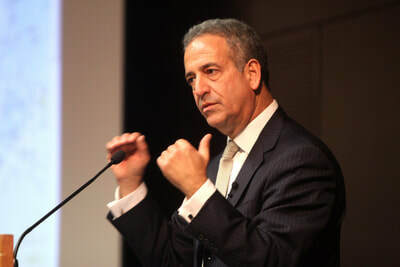 He is on a speaking tour of the U.S. during March 2019 at the invitation of the American Friends Service Committee (AFSC). 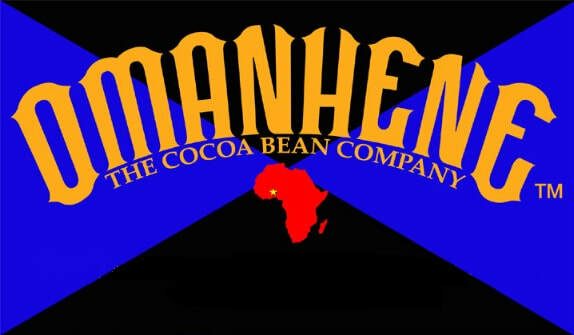 Join us February 19th to learn more about Omanhene Cocoa Bean Company headquartered in Milwaukee that works closely with chocolate production in Ghana. *If you have a copy of Steve Wallace’s book, “Obromi and the Chocolate Factory: An Unlikely Story of Globalization and Ghana's First Gormet Chocolate Bar”( Skyhorse Publishing, 2017), please bring it with you. He will be signing books at the event!! Presentation by Liberian Assistance Program (The Winner of the 2018 Global Citizen of the Year Award) on their work in Education. 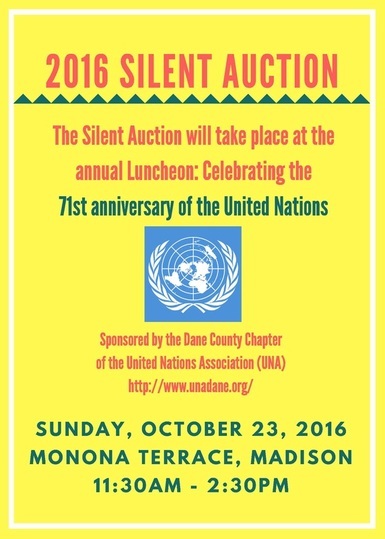 UN Day Luncheon: "The Role of Human Rights in Achieving Peace and Stability in The Great Lakes Region of Africa"
See more information about the silent auction below! UNA Members – you can be part of the 2018 Silent Auction Project! 1) You can donate a treasure from one of your travels – …or offer the donation of a ‘service’ – for example, preparing a Chinese dinner for 6 in your home – or offering your summer cabin for a weekend retreat! 2) Tell us about your donation – and write a few lines about it – Tell us where your item comes from – and add any specifics about minimum bids you’ll accept… or when the ‘service’ is available, or any other details. 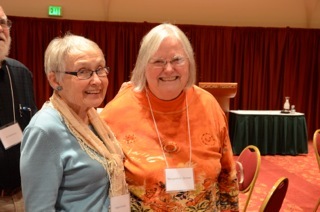 4) If you have an ITEM to donate, please attach a photo to your e-mail, so we can post it the UNA Dane County website. You can explain in your email how and when you would like to donate the item, and we can work with you to find a time and place. 5) And then, finally… come to the Fall Luncheon October 28th and place your BID!! "Global Health Programs: Big Successes in the Midst of Big Transitions"
Over the last twenty years, bilateral and multilateral global health programs have greatly expanded and have saved millions of lives. Many of these are “vertical” programs focusing on a single disease or condition, such as the Global Polio Eradication Initiative (GPEI) and the U.S. President’s Emergency Plan for AIDS Relief (PEPFAR). 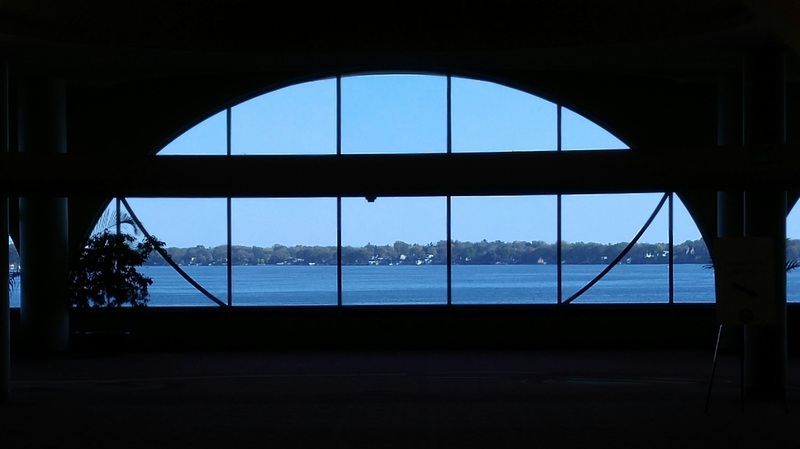 There now is a greater emphasis on “horizontal” programs to strengthen health systems. The new Director General of the World Health Organization has made universal health coverage, one of the targets of the Sustainable Development Goals, his top priority. And the new Executive Director of the Global Fund to Fight AIDS, Tuberculosis and Malaria says, “If we work together to mobilize funds, build strong health systems and establish effective community responses we will be able to end epidemics, promote prosperity and increase our global health security.” Ambassador Lange will discuss the many successes of global health programs as well as the challenges ahead in strengthening health systems. 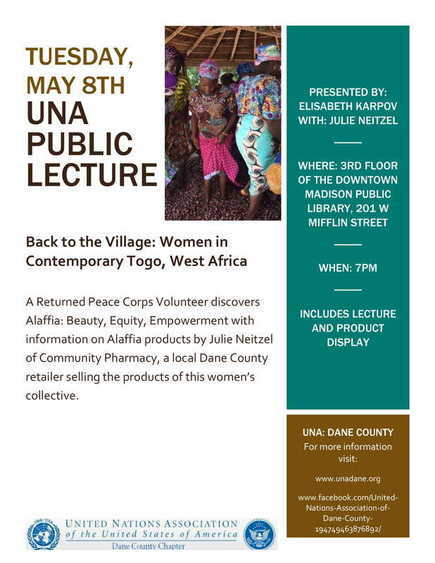 "Back to the Village: Woman in Contemporary Togo, West Africa"
UNA Public lecture and product display by Presenter Elisabeth Karpov, with information on Alaffia products by Julie Neitzel of Community Pharmacy; one of the retailers in Dane County selling the products of this women's collective. 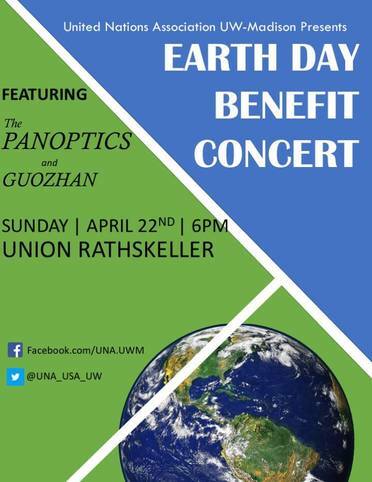 The UNA-USA, UW-Madison Chapter is presenting an Earth Day Benefit concert to promote both local and international sustainable development goals! We are excited to celebrate the preservation of our beautiful planet with you all! ESP presents "Dreaming the World Awake"
The Eastside Players are proud to present the world premiere production of 'Dreaming the World Awake', May 3-5, in the Margaret Williams Theatre. 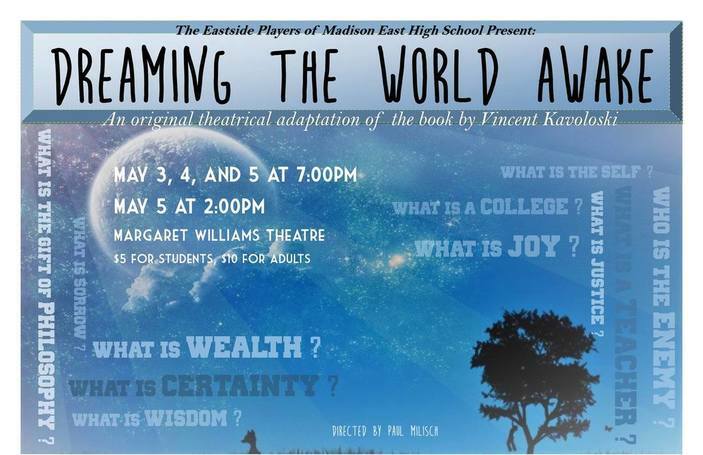 'Dreaming the World Awake' is an adaptation of the book by Dr. Vincent Kavoloski written by the Eastside Players and Paul Milisch. Dr. Kavoloski is a Professor of Philosophy at Edgewood College with a specialization in the Philosophy of Peace. 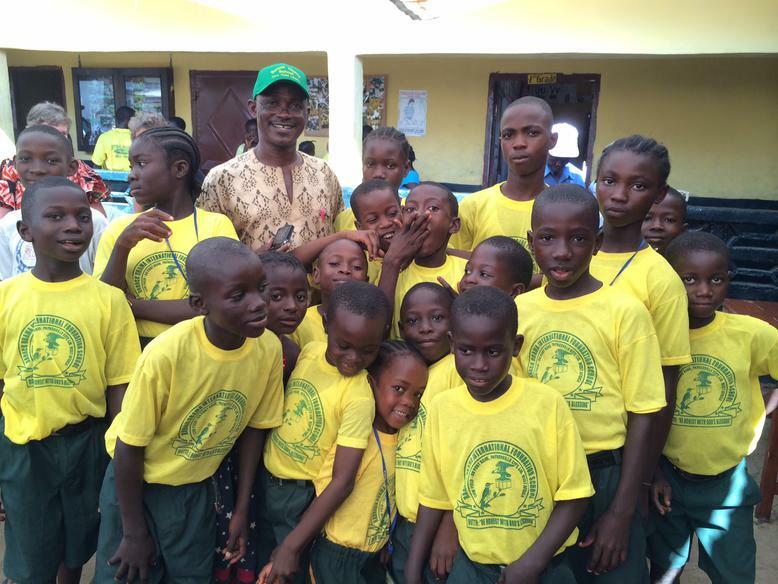 In October 2013 Vincent was named Global Citizen of the Year by the United Nations Association of Dane County. The performances are at 7pm with a matinee on May 5 at 2pm. Tickets are $5 for students and $10 for adults. 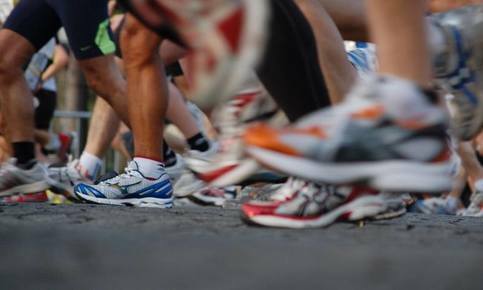 The April 21st Run for Refugees has been cancelled due to a lack of registrants.Those who registered will be reimbursed ASAP! Thank you for your support. When: Tuesday, March 20th, 7 – 9 p.m. This Adopt-A-Future dinner is part of a national UNA-USA program, launched in 2016, for chapters to raise funds to build classrooms in the Dadaab and Kakuma UN refugee agency camps in Kenya. Learn more athttp://www.unausa.org/programs/adopt-a-future. As of February 23, 2018, UNA-USA chapters had raised $130,000 for this project. These funds and any raised in 2018 will be matched through the Educate a Child Fund of Her Highness Sheikha Moza Bint Nasser of Qatar and other philanthropic partners, doubling the impact of the money the UNA chapters raise. For the Madison intergenerational program, in recognition of International Women’s Day – an annual March 8 celebration promoted worldwide by the UN since 1975, special guest Chef Francesca Hong, co-owner of Morris Ramen at 106 King Street, Madison, will talk about being a woman chef. 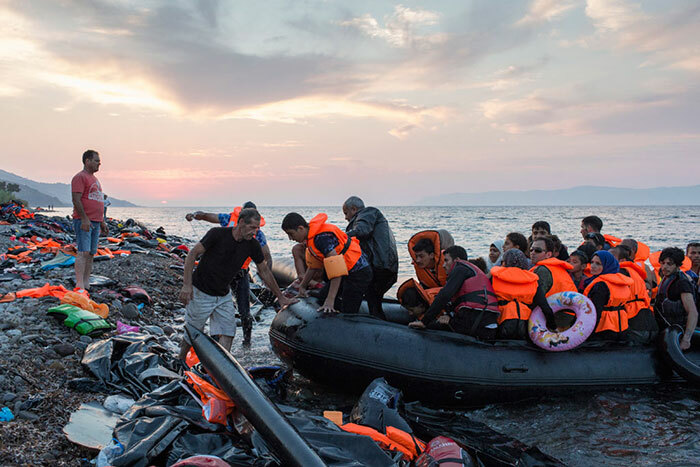 National UNA-USA Emerging Leadership Fellow and active member of both the Dane County and the UW-Madison chapters Prasangi Attapattu will discuss the refugee situation. 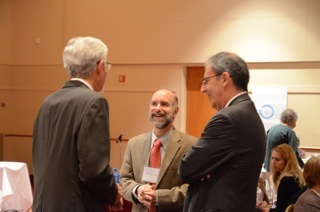 Before their remarks, attendees will share a potluck meal of dishes prepared by GenUN members and their families. Please bring a dish to pass, if it is convenient. But know that EVERYONE is invited and should attend whether or not they bring a dish to pass. 7 to 8 PM Sumudu Anopama Atapattu, Director of Research Centers and Senior Lecturer at UW Law School. 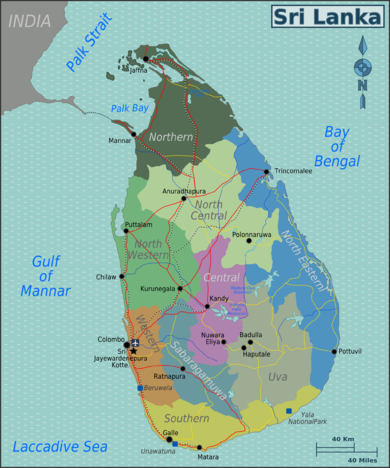 She will give a presentation on Sri Lankan culture and current events. Dr. Atapattu teaches in the area of International Environmental law and climate change and human rights . She holds an LL.M. 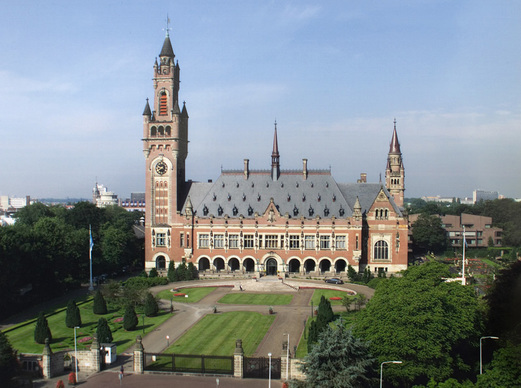 (Public International Law) and a Ph.D. (International Environmental Law) from the University of Cambridge, U.K., and is an Attorney-at-Law of the Supreme Court of Sri Lanka. Her books include: "Human Rights Approaches to Climate Change: Challenges and Opportunities" (2015, Routledge, U.K); "International Environmental Law and the Global South" (2015, Cambridge University Press) (co-editor); and "Emerging Principles of International Environmental Law" (2006, Transnational Publishers, New York). 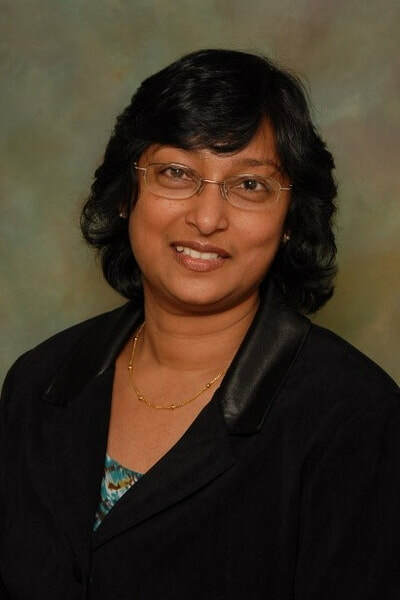 She is affiliated with UW-Madison's Nelson Institute for Environmental Studies, the Center for South Asia, and the 4W Initiative and was a visiting professor at Doshisha University Law School, Japan, in summer 2014 and Giessen University, Germany in summer 2016. She also coordinates the Human Rights Program at UW-Madison. 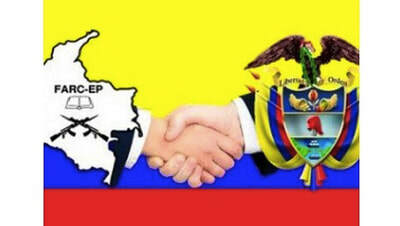 "Global StoryBridges: Connecting Youth Across the Globe"
"The Colombian Government and the FARC guerrillas signed a Peace Agreement to end 54 years of armed conflict, in which more than 200,000 people died and more than 7 million people have been displaced from their homes. Implementation of the Peace Agreement is underway, with a system of transitional justice designed to provide penalties for those guilty of crimes on a reduced scale in return for telling the truth about their involvement in the conflict. But.many obstacles to peace and social justice remain. I will report on what a delegation of the Colombia Support Network learned from a series of interviews we conducted in Colombia from November 7-17, and will assess the prospects for a successful conclusion to the armed conflict in Colombia." ​All welcome to this public event. 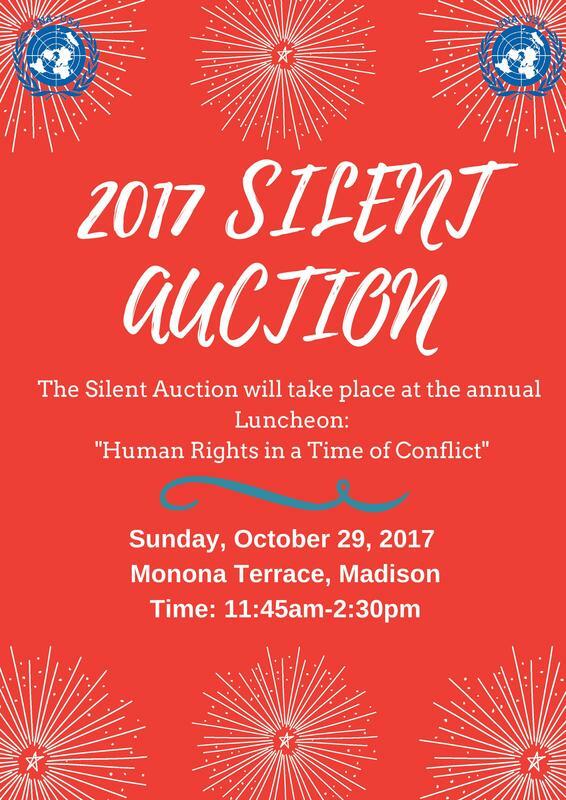 UNA-USA Dane County Chapter's 2017 Luncheon: "Human Rights in a Time of Conflict"
UNA Members – you can be part of the 2017 Silent Auction Project! …or offer the donation of a ‘service’ – for example, preparing a Chinese dinner for 6 in your home – or offering your summer cabin for a weekend retreat! ​4) If you have an ITEM to donate, please attach a photo to your e-mail, so we can post it the UN Dane County website. 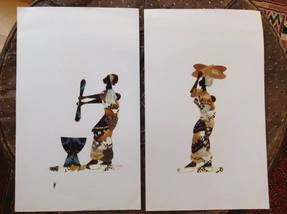 5) And then, finally… come to the Fall Luncheon October 29th and place your BID!! You’ll be getting your Luncheon Registration materials soon in the mail – watch for the flyer! 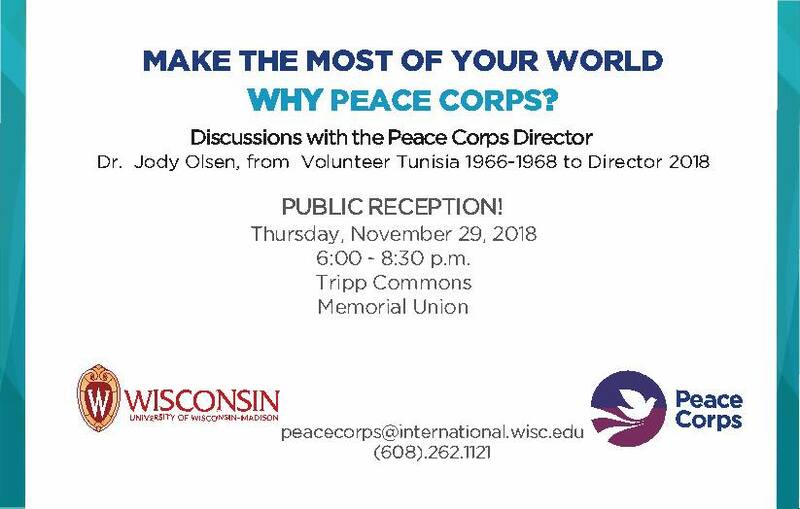 For the ninth year the United Nations Association of Dane County will honor one or more persons who have worked to improve the lives of others internationally or have worked to highlight the mission, value and goals of the United Nations. This award honors global work that improves the health, equality, environment, education, legal rights, living conditions, distribution of resources, rule of law or conflict resolution for people anywhere. 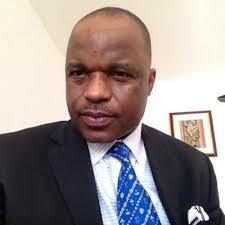 It may also honor someone’s work to enhance the knowledge and understanding about the work of the United Nations. ​The award will be presented on October 29, 2017 at the UNA Dane annual luncheon to recognize the founding of the United Nations. 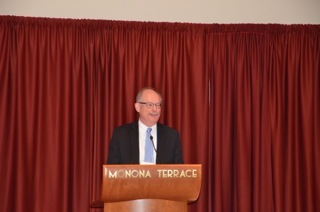 The award recipient is not required to be a member of UNA Dane County to receive this award and nominees are not required to live in Dane County, but they must work in Dane County. 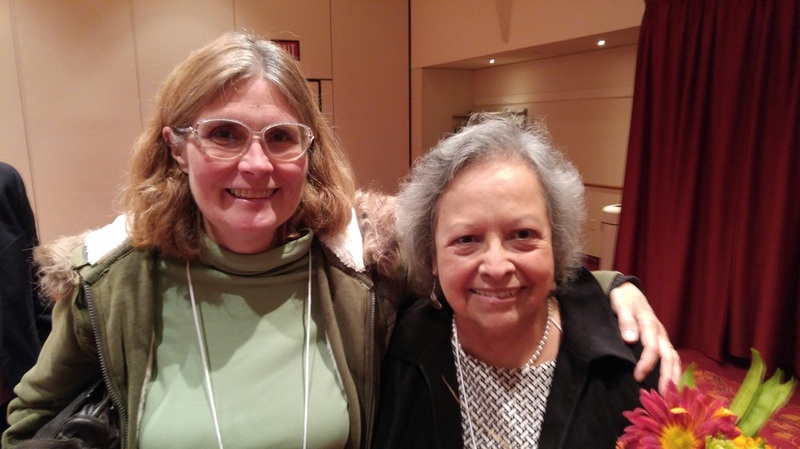 2015 Cecilia Zarate-Laun for her work helping Colombians create a peaceful participatory democracy and an economically just society. 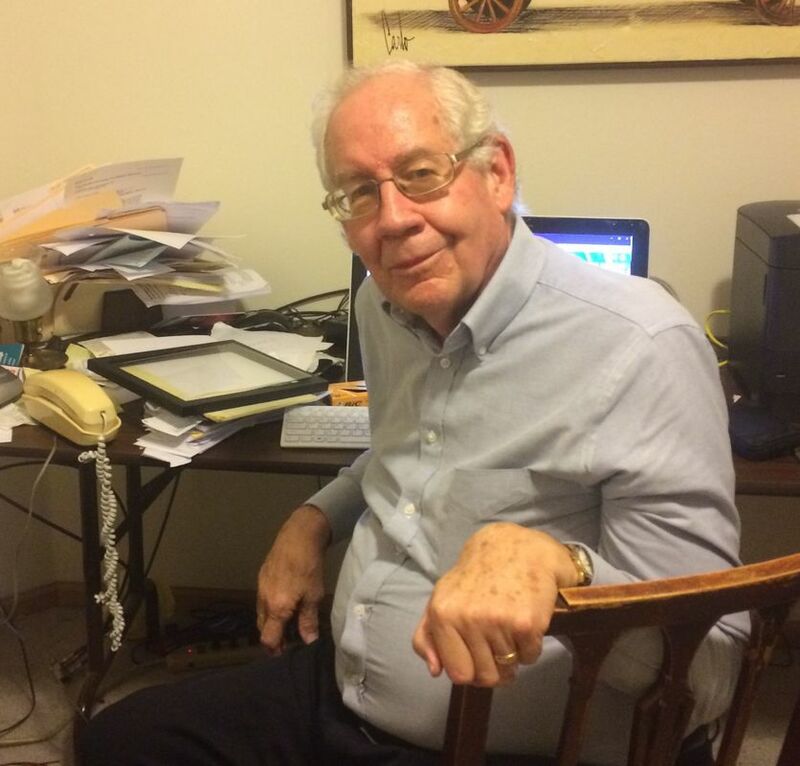 2014 Joseph Elder for his peace keeping in Kashmir, Vietnam, Korea, and Sri Lanka and promoting the work of the United Nations. 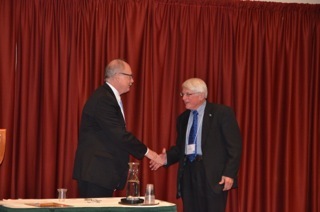 2013 Vince Kavaloski for teaching the philosophies of peace and social justice. You are invited to submit nominations on the attached Nomination Form by July 1, 2017 to Todd Kummer, 6 Nokomis Court, Madison WI 53711 or by email at finchcrk@tds.net. We prefer that you submit nominations in electronic format. 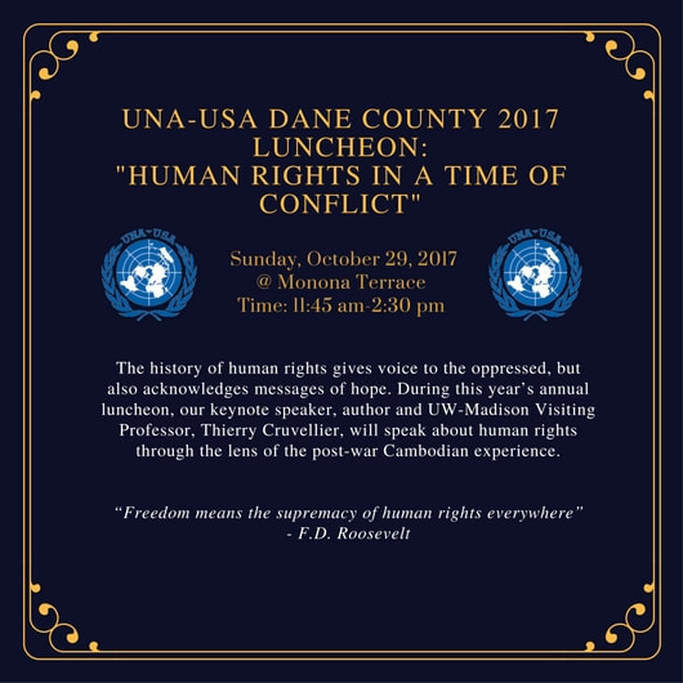 Cambodia will be a recurrent Dane County United Nations Association theme in 2017. 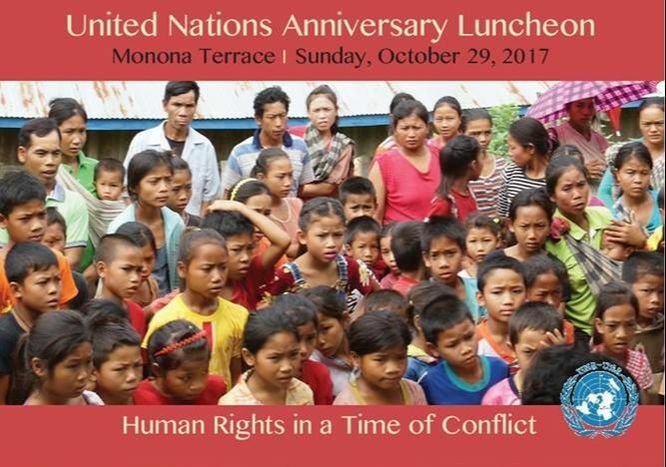 We have invited Professor Thierry Cruvellier, author of a book on war crimes in Cambodia, to be the speaker at our Sunday October 29 UN-Day luncheon (save the date). 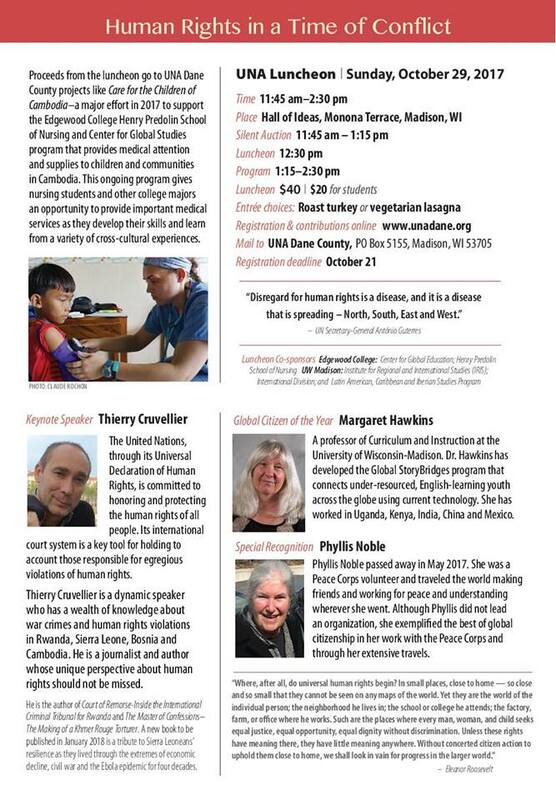 We have invited Sothy Tep, a member of the Cambodian parliament, to give a public lecture September 12 here in Madison. And we have promised to provide $3,000 to Edgewood College's Cambodia Service-Learning Program by December 2017. 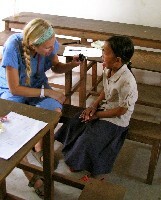 Every May and January Edgewood College students, under the supervision of Nursing Professor Claude Rochon, travel to Cambodia to teach and deliver medical supplies to Cambodian clinics that serve children. Our funding goal for the Edgewood College Program in Cambodia is $3,000. We have already committed to give the Cambodia Service Leaning Program an advance of $1,500 (half of our $3,000 goal) to support the May 2017 program. 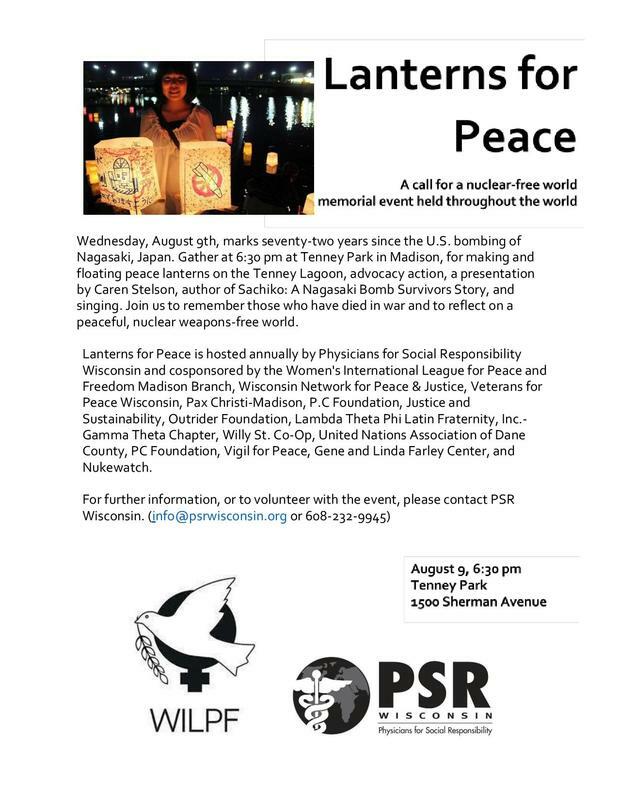 Checks payable to “Dane County Chapter of the UNA-USA” can be sent to: UNA-USA Dane County Chapter, P.O. Box 5155, Madison, WI 53705. You can also contribute by credit card or PayPal at unadane.org. Either way your donation is tax deductible. ​By giving to our 2017 UNA Project, you will help children and communities in Cambodia in need of medical attention and supplies. 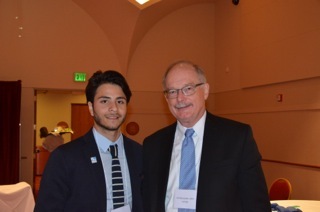 You will also help Edgewood College students benefit from international service-learning experiences. You will also help further goal number 3 of the 17 UN Sustainable Development Goals: “Ensure healthy lives and promote well-being for all at all ages.” You will also enact the motto: Think globally; act locally. Dane County Chapter of UNA-USA Achieves its 2016 Goal! 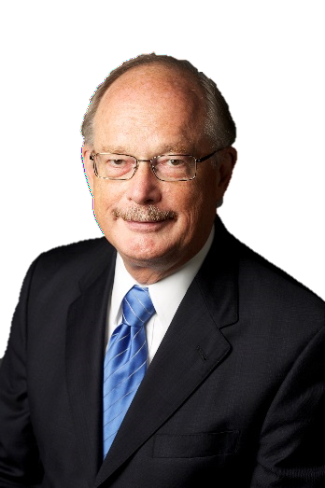 November 1, 2016 – Joseph W. Elder, President of the Dane County Chapter of the United Nations Association of the USA, announced today that the Chapter had successfully achieved its targeted goal for 2016 – raising $3,000 to give to the World Food Program. The World Food Program assists the United Nations in feeding the world's refugees and displaced persons. 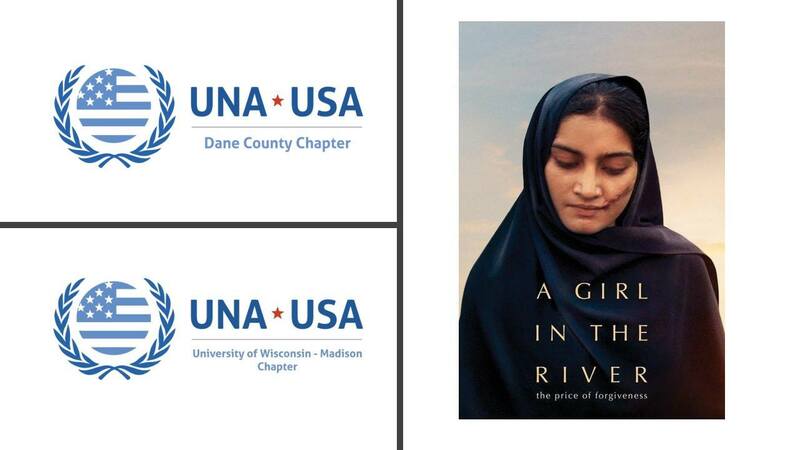 The Dane County Chapter, with the help of many of its members, raised the $3,000 by co-sponsoring a “Run for Refugees,” organizing a UN-Day luncheon, holding a silent auction, and receiving donations. 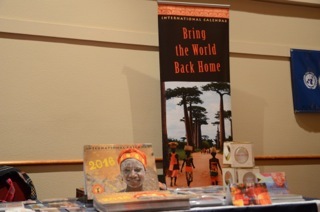 ​UN Members – you can be part of the 2016 Silent Auction Project! 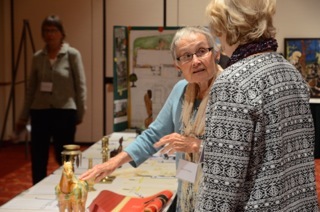 2)Tell us about your donation – and write a few lines about it – Tell us where your item comes from – and add any specifics about minimum bids you’ll accept… or when the ‘service’ is available, or any other details. 4) If you have an ITEM to donate, please attach a photo to your e-mail, so we can post it the UN Dane County website. B) Or, you can bring your item to the September UN Monthly Program Meeting at the downtown Public Library Tuesday Sept. 13, 7 pm, Rm #301. 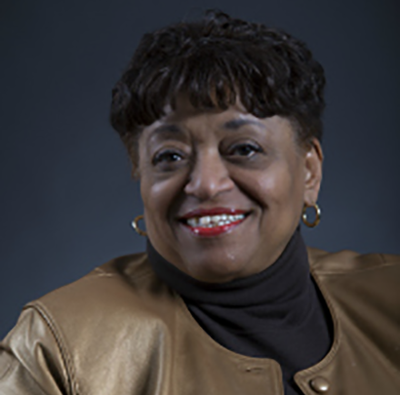 5) And then, finally …… come to the Fall Luncheon October 23rd and place your BID!! world and push towards more community engagement and community partnerships. 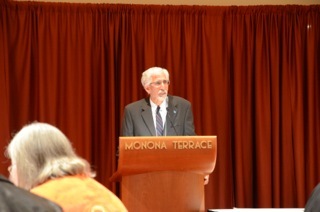 Wisconsin Microfinance was created to provide seed funding for small businesses in the developing world. By providing very small loans to very poor individuals, they seek to improve the quality of life of families and the economic potential of communities. Micro-loans empower individuals to take responsibility for improving their lives and break the cycle of dependency which is often created by short-term aid. All loans are made to individuals who are members of a lending group, and no member of a lending group can receive a subsequent loan until everyone has paid back their first loan. In addition, the majority of their loans go to women, as women are statistically more likely to invest the money into an endeavor that will improve the economic condition of her family. They have already seen the impact of micro-loans in communities in Haiti and the Philippines and hope to spread this impact of micro-loans to other communities. 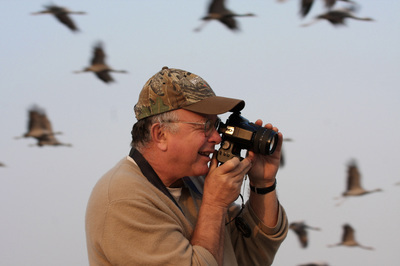 ​ George Archibald, co founder of the International Crane Foundation will speak at the March 8, 2016 (7pm) meeting of UNA Dane at the Madison Central Library. textiles in African markets, to the ancient poetry of the Ramayana in India, cranes figure prominently in the lives of people wherever they occur. Red-crowned Cranes are symbols of longevity, marital bliss, and good luck in East Asia. Sarus Cranes are the bridge to spiritual afterlife in Vietnam. Grey Crowned Cranes appear on the national flag, currency, and coat of arms of Uganda. 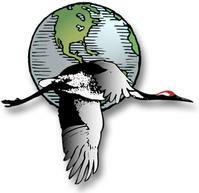 George Archibald, co founder of the International Crane Foundation, presents Cranes Across Borders. The future of crane was once as fragile as the delicate and graceful birds themselves. George Archibalds visionary leadership in international conservation efforts over the past 40 years has led to crane conservation worldwide. In 1973, when cranes were in peril and on the brink of extinction Archibald, along with Cornell University colleague, Ronald Sauey, PhD.,established the International Crane Foundation (ICF) in Baraboo, Wisconsin as the world center for the study and preservation of cranes. 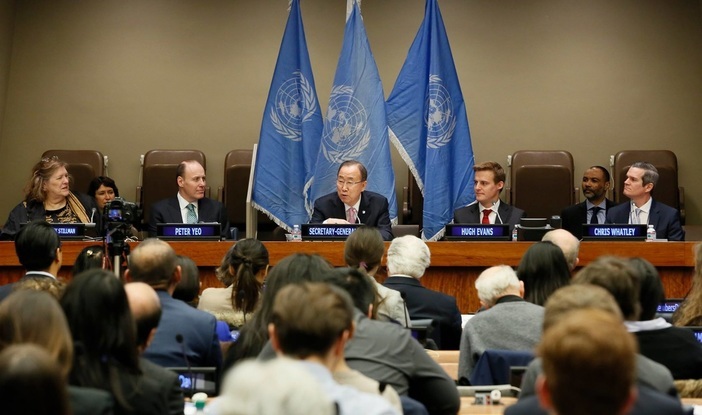 Don't miss out on what is expected to be the largest gathering of UN advocates in the United States--register today! Stay tuned to UNA-USA email and social media communications for more details on the conference program and speakers. 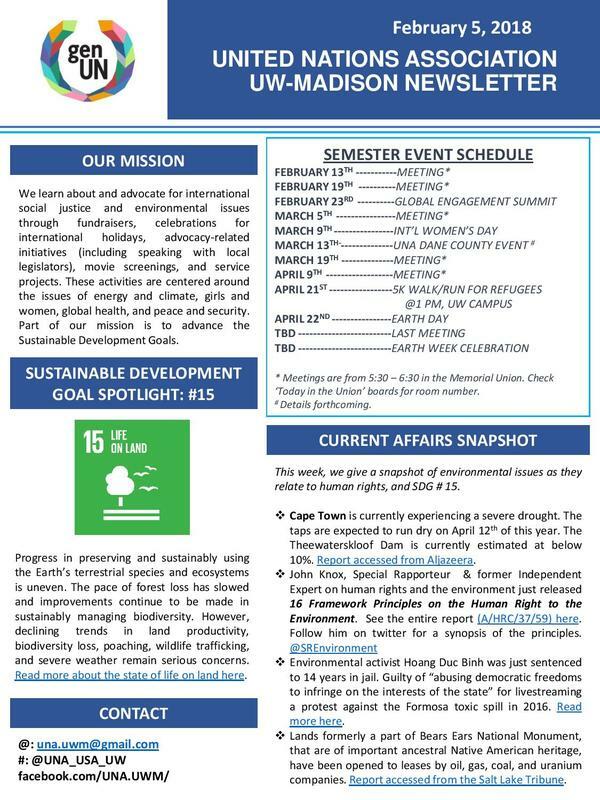 Email membership@unausa.org if you have additional questions. 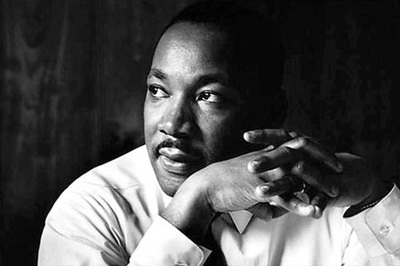 Thank you to all the folks who came out and joined us to remember the life of Dr. Martin Luther King. Special thanks to Barbara Nichols for her eloquent speech. 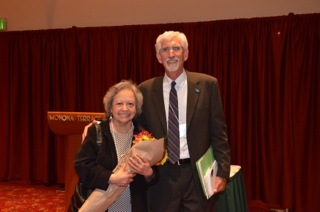 2015 Cecilia Zarate-Laun for the Columbia Support Network. ​Host John Quinlan holds a discussion on the Paris terrorist attack. Joey Johannsen and Gabi Helfert, who were in Paris in vacations during the attacks, skype in to the show. Franck Meunier, a native of France living in Madison, and Dr. Joseph Elder, UW-Madison Professor Emeritus of Sociology, and an international Quaker peace activist, join us in the studio.